James Haydon will stand in for Proton KR rider Kurtis Roberts, for the second race in succession, at the Kuala Lumpur round at Sepang on Sunday, October 10. Despite having no experience of the Proton bike when he arrived at the Qatar round, Haydon scored points with a 12th place finish. Prior to this he rode for the Virgin Yamaha team in the British Superbike series. The 29-year-old has competed in GPs before, last riding for the WCM team on a 500cc two-stroke Yamaha in 1996. 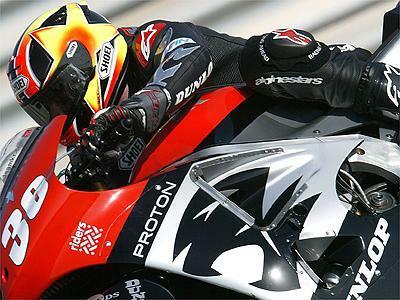 Since then he has raced in British and World Superbikes including a season with the Foggy Petronas team. There is no confirmation as yet as to whether Haydon will also join the team for the penultimate race of the season at Phillip island in Australia.